As a music producer or engineer, you probably rely on file-sharing services to get your job done. Your inbox fills up fast with various notes and feedback and you do your best to make sure everything is addressed. Some feedback is forgotten or a stem isn’t added to the project. This can be embarrassing, and screw-ups can lead to missed opportunities in the future. Bounce Boss minimizes human mistakes. Having all your files and comments in one place means you’re less likely to miss something important. “Vocals up from 02:12 - 02:47, Bass down from 01:24 - 01:31, Snare up from 03:06 - 03:59”? Going through the various time-stamps can be draining and often the time-stamps are wrong leading to incorrect changes. This is a waste of time for everyone involved. With Bounce Boss your collaborators can create a loop link within the comment itself allowing you to immediately preview the section they’re talking about. If working with audio is your business (or you want it to be), then you understand how important it is to have efficient workflows. Time is money and people don’t pay you extra for endless email exchanges. Doing things right the first time increases your value and allows you to focus on doing a great job and growing your business. Some people are disorganized, that’s not going to change. By using Bounce Boss, you’ll turn anyone into an effortlessly efficient collaborator. When someone sends you files, give them your ‘Client Invite To Project’ link. 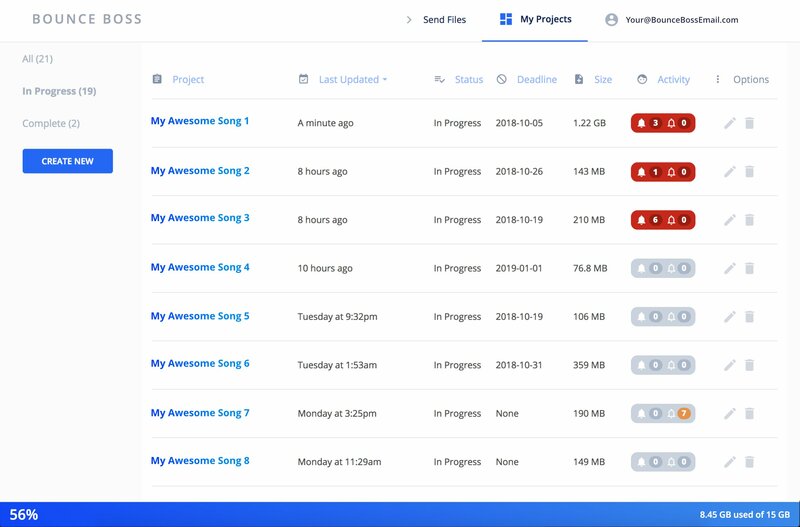 This will give them a simple to use upload page that will make sure every project that lands in your inbox is organized. If you’re a mixing or mastering engineer you know the pain of receiving audio files, waiting to open them in your studio and finding out that you can’t work with the files because they don’t have enough headroom or are clearly over-compressed. 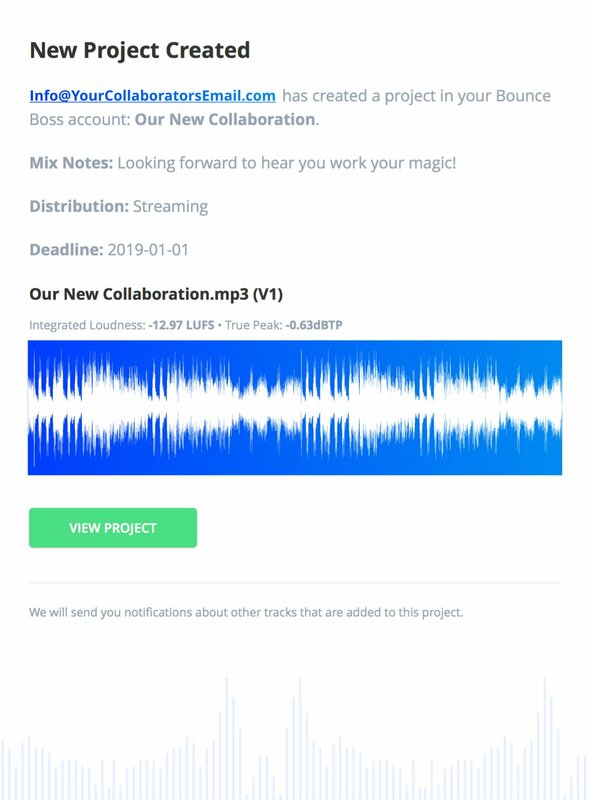 When you receive audio files via Bounce Boss, you’ll see the waveform visual and the technical details of the files in the email itself. So you’ll know instantly if you’ll be able to work with the files. Not only does this help you complete the project faster, but it also shows your clients that you iron out issues quicker than others. Audio engineering is a competitive business, and speed can be the clinching factor when people decide to work with you or someone else. To find your invite link, click your email address in the top right corner of Bounce Boss, then click Account, and you’ll see your ‘Client Project Invite Link’. When you send this link, your collaborators will see your upload page. As an audio engineer or producer, you’re probably aware that louder music can appear to have a stronger low-end and crisper high frequencies. This can be frustrating when the people you work with want to push their music as loud as possible. The vast majority of people won’t bother doing that, and even if they do they might get it wrong. 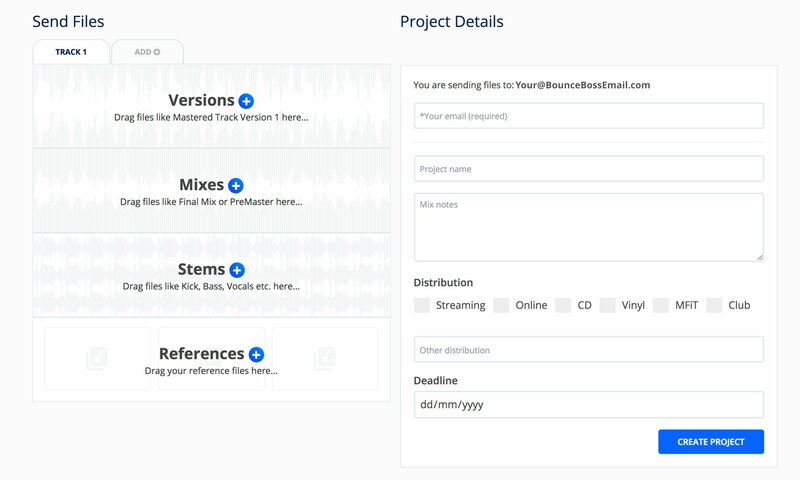 With Bounce Boss, your collaborators can level match all the tracks in the project with just one simple click. You’ll never have to sacrifice the quality of your work by pushing your masters louder than anyone else. You can deliver dynamic music without being penalized for not making it super-loud. The ‘My Projects’ page makes staying on top of everything the easiest part of your process. Even if you have 100 projects you could quickly preview which projects require your attention and which projects require the attention of your collaborators. The activity counter shows your unseen notifications on the left and your collaborator’s unseen notifications on the right.